The 'Sculpture Park' at the famed Madhavendra Palace inside the Nahargarh Fort aims to turn the entire venue into an art gallery, with sculptures displayed indoors as well as outdoors. Curated by Peter Nagy of Delhi's Nature Morte gallery, the exhibition comprises artworks by 16 Indian and nine international artists. Called the “Sculpture Park” the display at the famed Madhavendra Palace inside the Fort aims to turn the entire venue into an art gallery, with sculptures displayed indoors as well as outdoors. It is believed that during the 1857 Uprising, many wealthy and powerful Britishers were moved to Nahargarh Fort by the king of Jaipur, Sawai Ram Singh, for their protection. Standing on the edge of Aravali Hills, overlooking the city of Jaipur, the fort was built in 1734 by his forefathers. The historic venue is having a unique brush with art these days, as an year-long exhibition of contemporary artwork by Indian and international artists began a few weeks ago. Called the “Sculpture Park” the display at the famed Madhavendra Palace inside the fort aims to turn the entire venue into an art gallery, with sculptures displayed indoors as well as outdoors. Curated by Peter Nagy of Delhi’s Nature Morte gallery, the exhibition comprises artworks by 16 Indian and nine international artists’ including Huma Bhabha, James Brown, Stephen Cox, Vibha Galhotra, Subodh Gupta, Jitish Kallat, Bharti Kher, Gyan Panchal, LN Tallur and Ravinder Reddy. Aparajita Jain and Peter Nagy. Kallat adds that the historic site provides not just an evocative backdrop, but adds another layer of context to their art. The Mumbai-based artist, who has worked with Nagy for two decades, says Nagy was “keen on juxtaposing his work Annexation with the architecture of the fort”. The work comprises an enlarged kerosene stove, carrying on its surface numerous species engaged in acts of consuming something or in an act of making love, an image of a perpetuation of life derived from the porche of the Victoria Terminus building in Mumbai. 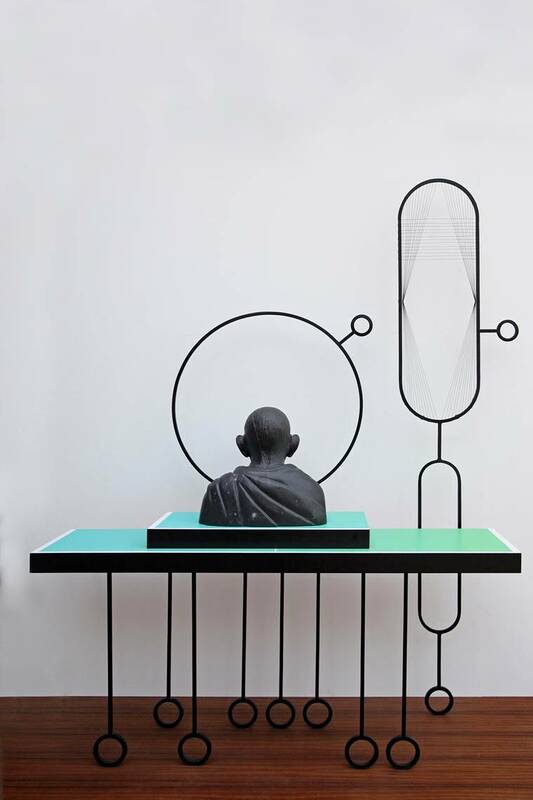 His other work to be exhibited in Jaipur is titled “Vertical Chronicle of Turbulent Equilibrium” — a hand-rendered sculpture where the bamboo-like surface has the very imagery that one finds on the surface of Annexation.